It is widely recognized that concrete is a sustainable building material and contributes toward achieving certification for most types of construction projects under the LEED green building rating system, developed by the U.S. Green Building Council (USGBC). What is less recognized, and virtually undocumented, is how decorative concrete impacts the process of obtaining LEED certification. Concrete itself can be a large contributor to obtaining LEED certification, but so can the decorative finishes used to give concrete its endless color and design options. The growth in the popularity of sustainable building has driven the decorative concrete industry to develop products that not only fit the "green" building trend, but also give designers, architects and homeowners more ways to incorporate colorful and artistic elements into their designs while earning LEED credits. Here we discuss how specific decorative concrete finishes can contribute, directly or indirectly, toward obtaining LEED certification. "LEED is an internationally recognized green building certification system, providing third-party verification that a building or community was designed and built using strategies aimed at improving performance across all the metrics that matter most: energy savings, water efficiency, CO2 emissions reduction, improved indoor environmental quality, and stewardship of resources and sensitivity to their impacts." Each key category is comprised of specific and measurable tasks that must be met to be awarded points, or LEED credits. The greater number of points results in a higher LEED ranking. There are 100 possible points, and it takes 40 points to qualify for the minimum LEED certification. For more information about the LEED program and how to achieve certification, visit the USGBC website. Depending on the type of finishes or materials used in decorative concrete, the impact on obtaining LEED points may be direct or indirect. The impact is direct when the decorative product is the primary finish and will directly contribute toward obtaining a LEED credit. A good example of this is a low-VOC stain and sealer system for the concrete floors of a project that meets the criteria of Credit 4.1 for low-emitting materials. Decorative finishes that indirectly impact obtaining LEED credit enhance the primary system, but don't alone contribute toward LEED certification. An example is adding integral color to pervious concrete paving used on an exterior parking lot to control water runoff (Credit 6.1: Stormwater Design). The integral color is a decorative enhancement to the paving, but has no impact, positive or negative, toward obtaining the LEED credit. The goal: One of the key goals of LEED is to minimize the impact of construction on surrounding exterior environments, communities and eco-systems. Heat and light are two of the biggest environmental pollutants when buildings are constructed. One of the measurements used to determine the effect of construction on an environment is the heat island effect. "Heat islands" are thermal gradient differences between developed and undeveloped areas. Under the Sustainable Sites section of LEED, Credit 7.1 intends to reduce heat islands to minimize impacts on microclimates and human and wildlife habitats. This is accomplished by using a combination of shade (manmade or trees), pervious surfaces, or reflective hardscape surfaces (driveways, parking areas, courtyards, sidewalks and other landscape surfaces) for at least 50% of the hardscape surfaces on the project. The materials used must have a solar reflective index (SRI) of 29 or greater. The decorative concrete solution: The use of colored concrete, either with integral color or a topical color hardener in light shades, is the best way to ensure the SRI of 29 or greater is met. The color can be used in standard concrete, stamped concrete or pervious concrete to meet the requirement. In the case of renovation projects, light-colored microtoppings or stampable overlays can be used to provide a decorative finish that meets the SRI of 29 or greater. The goal: The intent of this LEED credit is to reduce indoor air contaminants of all types that can be irritating or harmful to both occupants and installers. It focuses on reducing the VOCs (volatile organic compounds) of adhesives and sealants used in the construction process. To qualify for this LEED credit, the sealant must not exceed 250 g/l of VOC. 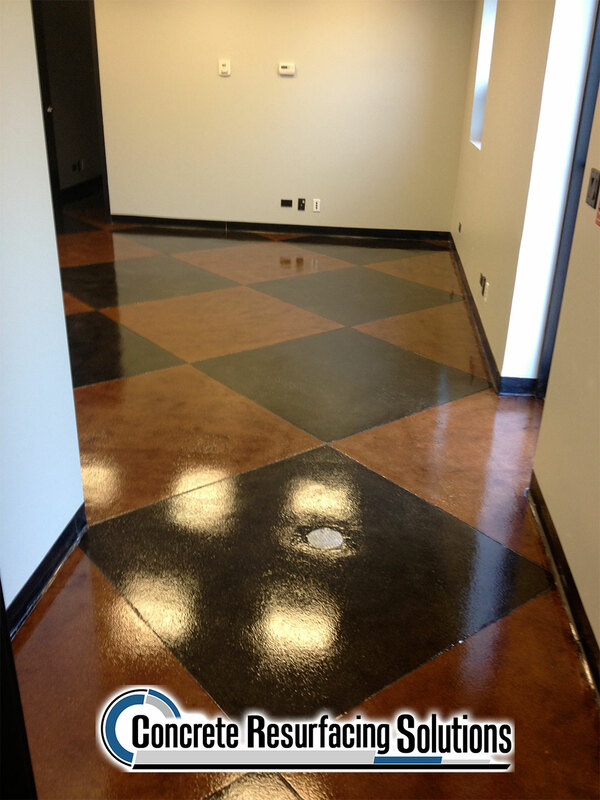 The decorative concrete solution: Most interior concrete, decorative or plain, is sealed to protect and enhance it. In the past, concrete sealers contained large amounts of organic solvents that would linger long after the construction process was complete. These fumes would be irritating to the occupants, and long-term exposure could lead to more serious health risks. This has spurred the development of a new generation of architectural coatings and sealants for concrete that meet the stringent low-VOC requirements of LEED. 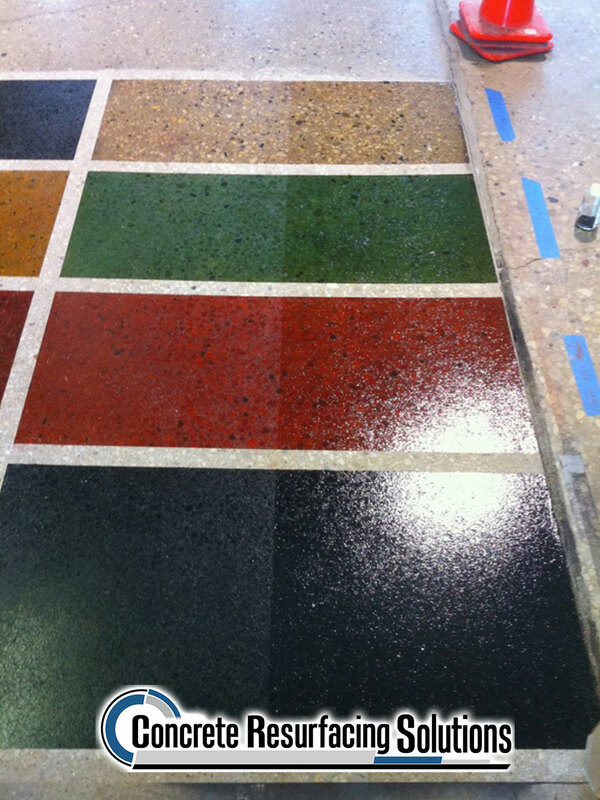 The use of architectural sealers and coatings to enhance and maintain concrete floors, walls, precast panels and countertops is a great way to bring out the beauty of concrete. These decorative sealers can be clear or colored, opaque or translucent. Today, most decorative concrete sealer manufacturers offer both solvent- and water-based LEED-compliant products. The goal: The overall intent of this credit is to reduce indoor air contaminants of all types that can be irritating or harmful to both occupants and installers. However, it focuses on complete flooring systems like carpet, vinyl composition tile and concrete stains, vs. just a single adhesive or sealant (as in Credit 4.1). The three major flooring systems that qualify for this credit are carpet with new-generation adhesives, low-emitting hard flooring surfaces (including vinyl, linoleum, laminate, wood, ceramic and rubber) and concrete stain and sealer systems that meet low-VOC requirements. The decorative concrete solution: Of all the LEED credits, this one in particular allows the most impact for decorative concrete flooring systems. In fact, the requirements for obtaining credit actually call out low-VOC emitting "concrete stain and sealer finish systems" as one of the ways to do so. Of the three flooring materials that qualify for this credit, decorative concrete enhanced by concrete stains and dyes provide the most color and design options. What's more, decorative concrete floors do not require additional layers of floor covering because the concrete also functions as the flooring surface. This greatly reduces material consumption, transportation costs, and flooring installation time and cost. Almost all water-based stains and dyes with a low-VOC emitting sealer system will meet the LEED requirement for this credit. This includes acid stains, concrete dyes, water-based tints, acrylic stains, tinted sealer systems, and the new generation of eco-friendly stains made from renewable resources such as soy bean oil. Water-based dyes, tints and sealers are especially ideal for achieving credit within this category because of their expanded color palette, zero-VOC content and fast cure times. 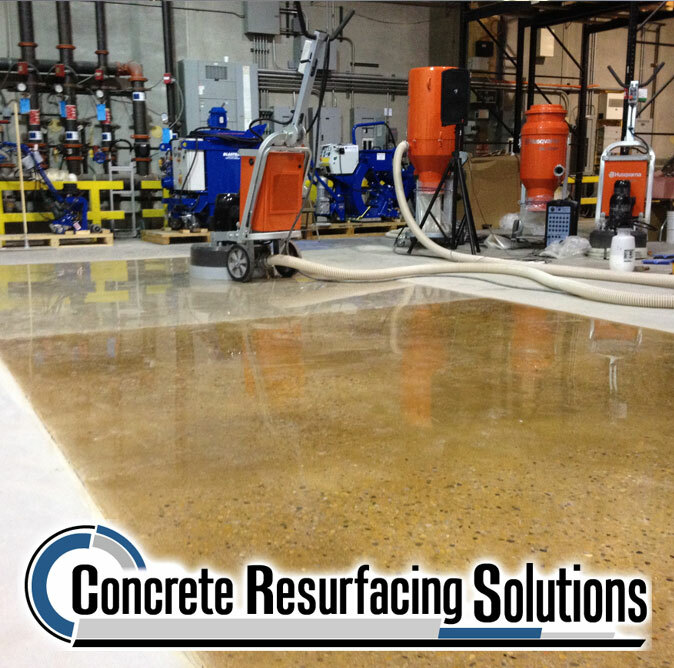 With certain stain or dye systems, thousands of square feet of concrete can be prepared, stained, sealed and returned to service in under 24 hours. Most stain and dye manufacturers offer low-VOC LEED-compliant products in their lines. There are seven categories where the use of concrete with decorative finishes or admixtures has an indirect impact on obtaining LEED certification, with each worth 1 LEED point. For full guidelines, see UGBC's LEED 2009 for New Construction and Major Renovations Rating System (PDF). The use of pervious concrete to help direct stormwater runoff back into the environment without the use of large artificial collection areas is a direct LEED qualifier. The use of integral color to beautify the pervious concrete is an indirect impact on the LEED credit, and helps minimize the artificial look of large expanses of gray concrete flatwork. Identical to Credit 1.1, but using 95% of existing floors, walls and roofing vs. 75%. Using supplementary cementitious materials, such as fly ash, silica fume and slag cement, are considered pre-consumer strategies for use of recycled content. Using recycled concrete or slag instead of extracted aggregates qualifies as post-consumer. Using these materials will directly impact obtaining this LEED point. Using integral color or shake-on color hardener when pouring concrete with post- and pre-consumer materials will have an indirect decorative impact. Tip: When using integral color with concrete containing supplementary cementitious materials, such as fly ash, silica fume and slag, dose the color based on the weight of the portland cement plus the weight of the supplementary cementitious materials. Identical to credit 4.1, but containing 20% vs. 10%. This credit supports the use of local materials and reduced transportation distances. The requirements stipulate the use of building materials or products that have been "extracted, harvested or recovered, as well as manufactured, within 500 miles of the project site for a minimum of 10% (based on cost) of the total material value." Concrete will usually qualify for this credit since ready-mix and precast plants are generally within 50 miles of a jobsite. Adding color to the concrete will have an indirect impact. Also, decorative toppings, stains, color hardeners and sealers manufactured within 500 miles of the project site will also have an indirect impact on obtaining this LEED credit. Identical to credit 5.1, but 20% extracted vs. 10%. 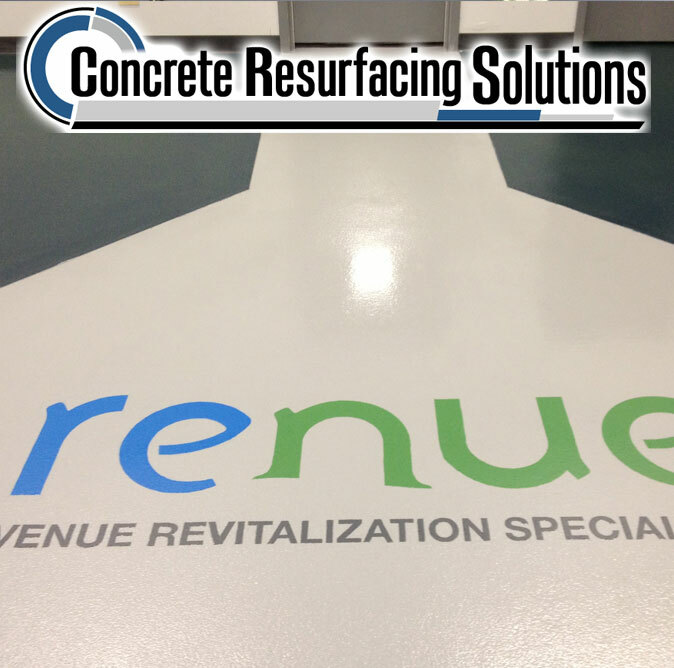 Copyright © 2015 Concrete Resurfacing Solutions, Inc. All Right Reserved.